An uplifting collection of tales and words to lift your heart and spirits. The intention of Write For The Fight, co-authored by Tess Hardwick and Tracey M. Hansen, was to create a compilation of personal essays to raise awareness and funds in the fight against Cancer. What they accomplished is a compilation of heart-wrenching, poignant, touching, and joy-filled memoirs written by some incredibly talented writers. Tess and Tracey capture your interest and your hearts as you first gaze upon the cover. Created by Tess’s own artistic and inspiring mother, the cover shows four tulips in various stages of life to emulate the human spirit as we change and grow through the seasons and years. 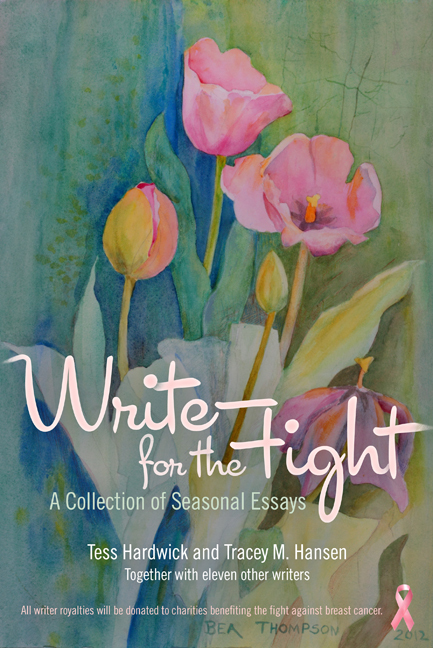 Write For The Fight encompasses several writers on their journey through their lives in four seasons: what they miss most about being five years old, advice they would give to their younger, twenty year old self, what they envision for the futures, and what they would like people to say about them at their eightieth birthday party. Each section brings you further into these authors’ lives, and you will find yourself laughing and even shedding a tear at the memories and advice that they share. When you begin the journey into these writers’ lives, your own memories of your youth will begin spilling forth. For example, I remember well our own orange and brown shag carpeting, and I too wished that I could be Madeleine L’Engle. Although, I’ve had the distinction of being born a girl, so I was one step closer to that dream than Jesse James Freeman. The authors’ own individual memories and voices surround you as you begin to remember what your own childhood was like. Their memories are comforting and food for the soul as you smile from remembering your own innocence, freedom, and cherished memories from when you were five years old. Looking back at their twenty year old selves, the authors try to impart what wisdom and knowledge they have gained since then. Although to be honest, most admit straight out that they, as is often the case, knew everything back then and weren’t always open to suggestions or advice. The messages to each of the authors’ younger selves varies, but always leaves you with the reminder that you are unique, you are special, and that you are worth it. Let’s face it, everyone has dreams. Whether you dream large or small, everyone has that little list on paper or in their mind of what they would like to do, to see, or to be. The authors in this compilation share some of their innermost desires with us all. Some of which I nodded my head in agreement with and said: Yes! I want that, too! But then my cats were looking at me oddly, so I stopped talking out loud to myself. Some of the dreams that they share are interests bound by common desires. Being writers, I think that we all want that getaway place to do nothing but to sit and enjoy the view and let the words flow freely from our minds onto paper. But it’s not just materialistic dreams that the authors share with us. These are the desires of the heart, the dreams that will make their hearts sing with joy. And, in return, will make your heart begin to sing, too. Loudly. What would you like someone to remember most about you, while celebrating your life? These writers delve deep into what they would find most fulfilling. Whether they want everyone to simply know that they were a kind, generous soul, or the savior of humankind from the inevitable zombie apocalypse, they can all agree that they want to be remembered with smiles, laughter, and love. I consider myself truly blessed to know many of the writers that contributed to Write For The Fight. Having read their stories, I appreciate the friendships that we have even more. Even if you don’t know the authors personally, you will not regret picking up this book and reading their words. Because, even though their memories and words are as unique as the individuals themselves, the messages are the same and easily understand by everyone who reads them. Do not hesitate. Go now and pick up Write For The Fight. You will not be disappointed. You will laugh, smile, and perhaps even cry. Through it all, you will remember. You will reflect on your own life, rejoice in what has brought you joy in the past, and think about what you hope and dream for the future. And along the way, your purchase of Write For The Fight will aid in the fight against a disease that has touched us all. May it help us in the fight to bring an end to Cancer, once and for all. Never give up. Never surrender, my friends. It’s a great effort you all are doing!